Home > Sonata > 2016 Hyundai Sonata – What’s New? 2016 Hyundai Sonata – What’s New? As the 2016 Hyundai Sonata enters its seventh generation, it does so in a segment that is filled to brimming with great competition. The family 4-door sedans that it has to go against include the well-known Honda Accord, Chevy Malibu, Kia Optima, and Toyota Camry, which means the Sonata really has to deliver the goods if it wants to stand out in that crowd. 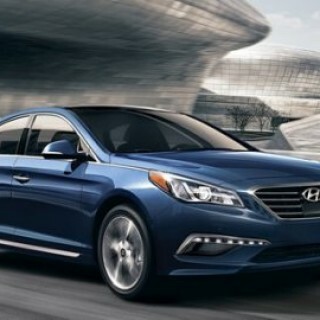 The Sonata got a redesign for the 2015 model year, and is now a little more conservative and refined than before. Gone is the flamboyant styling of older generations, with Hyundai now leaning towards a more conservative style that not everyone is going to like. Any qualms about the exterior style are quickly forgotten when you get a look at the redesigned cockpit. There is definitely a German type feel to the layout of the cabin, which is actually very similar to the Kia Optima in many ways. A little splash of flair can be found with the addition of carbon fiber and aluminum-like trims in the cabin. Among the changes made to the 2016 model are the addition of emergency braking to the forward collision system, new aluminum suspension components, and a 7-inch touchscreen that can be synced with Android Auto on your smartphone. The 2016 Sonata Limited adopts the more aggressive looking bumper used on the Sport model. Cars in this class don’t come much lighter, and the Sonata was also among the first in the segment to make the move to a 4-cylinder engine. Both the 2.4-liter base and the 2.0-liter turbo 4-cylinder engines go about their business quietly and with little vibration to speak of. Both engines come equipped with a 6-speed automatic that also has Shiftronic manual controls that allows for seamless shifting. The 2016 Hyundai Sonata Sport 2.0T models have paddle shifters, and every member of the Sonata family offers a trio of driving modes – Eco, Normal, and Sport – that deliver a little bit of a driving feel. These settings are for drivers with specific driving needs, and most will simply be comfortable going with the default mode, which is perfectly fine. Hyundai partnered with Lotus to iron out the wrinkles in the handling of the 2015 Genesis. The lessons learned have been carried over to the 2016 version of the Sonata sedan. The vehicle has a stiffer body structure that helps it smooth out bumps in the road. Ride quality and handling have been improved with the addition of the aforementioned aluminum components. There is little change to the Sport 2.0T, although it does come with more robust P235/45R18 tires. The electric power steering does a good job of maintaining balance, which means it doesn’t wander or get pulled by excess weight. The Eco is not what can be called a mild hybrid, as it comes with a small displacement 4-cylinder mated to a dual-clutch transmission under the hood that delivers a rather impressive 177 horsepower. That set-up allows the car to achieve 32 mpg, which is a number that ranks it near the top for non-hybrid models. Where the Sonata really shines is in the space department. While the EPA classifies it as a large vehicle, the Sonata is actually sold and marketed as a midsize. This puts it in the same classification as the likes of the Altima and the Fusion, but a little below the Chevy Impala. The legroom up front is very good, and even people 6 feet tall and up will enjoy a comfortable ride. There is even more than enough space to cross over a knee, for those who like to adopt a little yoga stance when sitting in the passenger seat. The back seat is not quite as forgiving, but is still similar to that of the other vehicles in the segment. There are a ton of storage bins in the Sonata, meaning there is plenty of room for all your knick-knacks. The trunk is also larger than expected, with a total of 16.3 cubic feet of space. The trunk also houses seat-fold levers that come in very handy. NVH levels are good, and you can easily hold a conversation in the cabin without yelling. The Sonata has scored well in crash tests, getting 5 stars from federal ratings, as well as “good” ratings in all but the small overlap test from the IIHS. Safety systems offered include driver knee airbag, blind spot monitoring, adaptive cruise control, and a forward collision system with emergency braking. The Sonata line-up is quite the mixed bag. The 2.4-liter engine is found in the SE, Sport, and Limited trims, while the 2.0T is found in the Sport and Limited trims. The Eco comes with the 1.6T engine. Starting price for the base SE model is set at $22,000, and includes standard equipment such as 16-inch alloy wheels, a rear lip spoiler, automatic headlights, cloth upholstery, an AM/FM/XM/HD/CD radio with a 7-inch color touchscreen, satellite radio, Hyundai BlueLink telematics, Android Auto, a rearview camera, a USB port, and Bluetooth with audio streaming. The higher up the trim level you go, the more equipment you get. The Sport 2.0T models add paddle shifters, a sport suspension, sport-tuned steering, quad exhaust tips, a rear diffuser, 18-inch wheels, aluminum pedals, and sport seats, and more. The infotainment system included with the Sonata is delivered on an 8.0-inch touchscreen that is compatible with smartphone apps such as SoundHound and Spotify. Cars that come with navigation also feature Apple Eyes Free Siri integrations. All of the trim levels now have the Google Android Auto smartphone system, with Apple CarPlay soon to follow.